Alan's Factory Outlet vertical metal carports are delivered and installed for free in 27 states in the USA. The vertical style carports are built in an a-frame roof and are engineered for the snow to slide of the roof as the roof sheeting is vertical up and down saving you time from having to shovel snow off of the roof. Also the rain will just slide off of the side instead of the front and back ends keeping you dryer on those rainy days as you enter or exit your car. Now is the time to look into all of the different options our storage sheds outlet has available. Our storage shed outlet prides itself of the quality products available for purchase. The only way that the sheeting can be attached to the roof on the vertical roof is for cross braces to be attached. 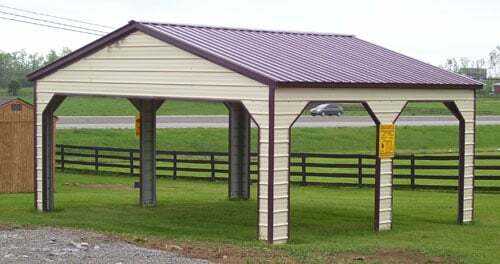 This also makes the vertical carport the strongest style of the three carport styles available when compared to the regular style carports and boxed eave carports. Carports as well as shed structures by Alan's Factory Outlet are durable and dependable. Even the pre build wood sheds include quality workmanship that Alan's is known for. 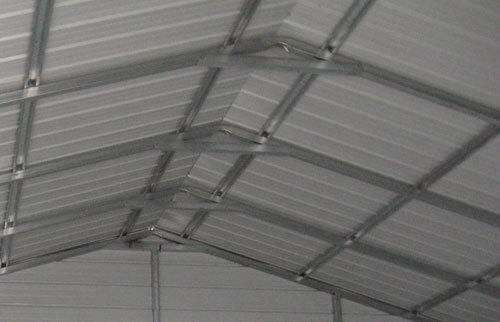 Here is a picture showing the cross braces under the vertical roof carport. Aside from carports, Amish built sheds, garages, and portable storage buildings are also delivered and installed by Alan's Factory Outlet. When it comes to competitive pricing and quality products, this storage shed outlet is the company people trust. All shed structures, including the pre build wood sheds can be delivered to a variety of different locations. On all vertical carports the roof is vertical. The sides and ends if closed always come horizontal. For an additional cost the sides and ends can be made vertical but they do not come that way. If you are interested in a custom built unit, consider the Amish sheds Virginia residents prefer. It is possible to create a customized structure that matches up to your specifications. While others already have set dimensions and features, the Amish sheds Virginia property owners choose have plenty of opportunities for change and improvements. Save money by shopping at the storage sheds outlet and pick out the unit that you have been searching for.